If there's a way to improve your workstation, we want a hand in it. Introducing the UPLIFT Advanced 1-Touch Digital Memory Keypad, a digital upgrade of our standard keypad complete with four programmable buttons that can store your height preferences within a tenth of an inch. Get smooth and precise transitions every time with the easy push of a button. This is the stand up desk accessory to get you to that working sweet spot within seconds. With two different settings to toggle between, One-Touch and Constant-Touch, you get to pick your desk's method of height adjusting. One-Touch requires only a single touch of the buttons to move the desktop to a preset memory location. Constant-Touch requires a continuous touch of the 1, 2, 3, or 4 buttons to move the desktop to a preset memory location. Choose from black, white, or gray to complement our collection of desktops, frames and sit-stand desk accessories. Can I change the minimum or maximum height of my desk with this keypad? Yes! Besides programming four height settings into memory, the Advanced 1-Touch Keypad will let you alter the min/max heights of your desk. Here is a blog post we have written which details this process. We think it is, and we are not alone! The Advanced Memory Keypad will let you find the perfect height for each of your tasks whether it is sitting, standing, perching, or using the treadmill. You can easily switch between any of these heights without any guesswork. The Advanced Memory Keypad also has a digital readout that displays the exact height of the desk. No, the Advanced Memory Keypad is not Bluetooth compatible. All components must be hardwired to the control box. First, adjust your desk to the height you want the UPLIFT Desk Advanced Digital Memory Keypad to save. Then press the M button, followed by the number you wish to use to store the memory setting. I have a two button keypad on my desk now, am I able to upgrade to the Advanced Keypad? It is likely that you will be able to upgrade to the Advanced Memory Keypad. However, you will want to call our Sales Pros so they can give you a definitive answer based on the model of desk you purchased. Does this come with all of the connecting wires I need to power my desk? Yes, the Advanced Keypad comes with a connecting wire that works with your desk's control box. You do not need to purchase a separate cord. 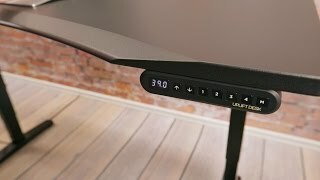 No, the UPLIFT Desk Advanced 1-Touch Keypad is only compatible with UPLIFT desks. I have an older UPLIFT control box. Will this work? More than likely, the answer is yes. UPLIFT Desk's Advanced Digital Memory Keypad is designed to work with their version 2,3, and 4 control boxes. This accounts for most users, but there is one early version of their control box that is not compatible with the keypad. If your control box looks like the box below, you have one of our first control boxes, which is not equipped to work with this keypad. You can upgrade to a new control box, however, which will make your desk compatible with the Advanced Keypad. The Advanced Digital Memory Keypad by UPLIFT Desk is available in black, white, or gray to match your frame and desk accessories. Was easy to install and works great. I haven't configured the memory settings yet because I'm still experimenting with different sitting and standing heights. The adjustments are so simple, I may not even need the memory feature. I ordered this with my desk after speaking to a representative from the company. He said it helps to have the digital memory keypad in case of the need to conduct diagnostics remotely, so I figured it was worth it. The pad works fine. Memory settings for me and my hubby who is a little taller than I. The only area for improvement is the screws which hold it onto the desk. I can't seem to get the keypad to be really firmly locked into place. It is securely attached (won't fall down from the desktop), but there is some play where it slides towards the back of the desk when I press the buttons and also pulls forward. I don't want to get too aggressive with the screws, but tightening doesn't seem to help. Very convenient, easy to configure. At first I thought this was a bit pointless compared to just getting an up/down switch. But it's just like the auto-up switch on your car window - you use it all the time and you would be annoyed if it wasn't there. I switch back and forth from sitting to standing a few times a day, and it's just nice to have the desk glide right to the correct spot without having to baby it. It shows the current height of the desk in inches, and for some reason in the morning I find it more comfortable to start at 49", but after about an hour, 47" seems better. For sitting I have it go to 37.5". So I use those three settings several times day. Totally worth it. Overall real simple to setup and use. Setting you preferred heights is real simple. The only thing that I really have to complain about is the fact that the provided screws didn't really fit in-between the plastic ridges, thus making it very difficult to fully tighten it without risking breaking the plastic. I absolutely love my desk and having this feature on it. It moves so easily to go up or down and trust me I switch positions a lot. This memory keypad was easy to install and setup. It makes life so much easier to be able to set your heights and just push a button when you need to move the desk. It is definitely worth the extra $30 to have this feature. The memory keypad is very easy to install and operate. Setting the memory is pretty easy. $39.00 List Price: $53.00* The list price is the same as the MSRP (Manufacturer's Suggested Retail Price). It may not necessarily be the price at which the product is sold.